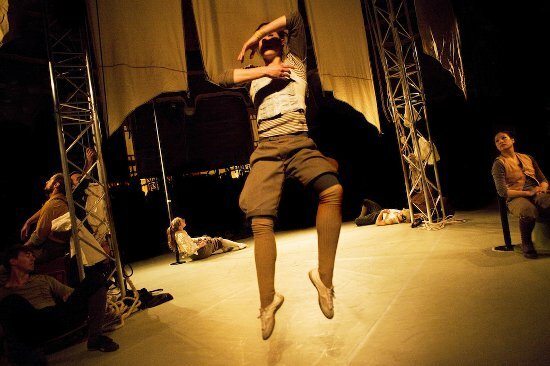 Rime is a new circus show devised and collectively made by Square Peg Contemporary Circus, based on Samuel Taylor Coleridge’s epic poem 'The Rime of the Ancient Mariner'. With thrilling acrobatics, song and story, Square Peg combine circus with theatre and dance – they use group acrobatics and human towers, Chinese poles, silks, and flips and tricks to tell this beautiful haunting tale. In 2012 Rime premiered at the Roundhouse's CircusFest and toured to the National Theatre's InsideOut festival, Winchester Hat Fair, Camp Bestival, Summerhall at the Edinburgh Festival Fringe, and the Devizes International Street Festival. This year the show is being redeveloped so that it can be more easily performed at slightly smaller venues. Tour dates: Mid-August to November 2013 (the company already have some bookings during this period and are currently working to fill the gaps) and spring 2014. Support: Square Peg are currently waiting for confirmation of a commission for the re-rehearsal/redevelopment of Rime, and are also looking for producing partners who can offer rehearsal space, or would like commissioning involvement. The set of Rime is made up primarily by the circus rigging. There is a truss portique (goal post) and two Chinese poles. The portique is dressed with a moveable (up and down) Yard (long horizontal pole) from which the sails are hung. This is also used like a trapeze, a tight rope and for various other circus routines. There are also large side sails and the layout of the poles and rigging cables add to the nautical look of Square Peg's full-dressed-ship. The whole affair is of course topped off with a flag pole. The acrobats climb all over the rigging but the floor is kept mainly clear for acrobatics and dance except for a few small props such as packing crates and cable drums. 8 floor points (min rating 1 ton) at specific points, ballast is also fine. These rigging anchors can be situated on the walls but detailed conversations about this are required.